This time of year is very busy in and around Assen with touring and racing events. 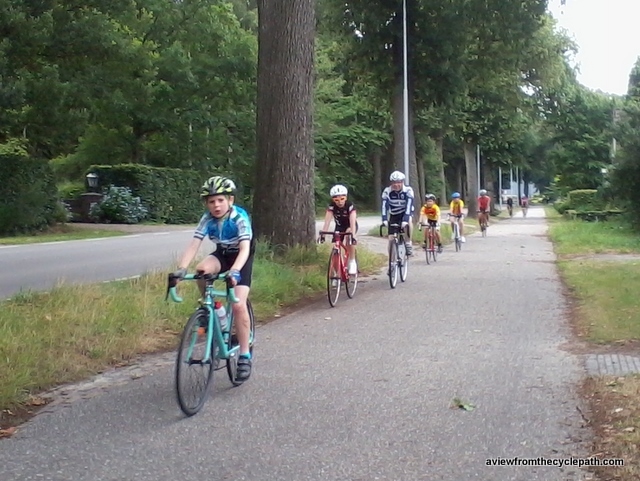 The Fietsvierdaagse is a four day cycling event which attracts 15000 participants, people from all age groups and all walks of life. Most people ride 40 km per day, a distance which is within the ability of just about everyone. Some village centres become virtual no-go areas for cars, but the routes run along the same network of cycle-paths and minor country roads as are used for riding the rest of the year. UNICEF say that Dutch children have the best well-being in the world. Don't children from other countries deserve the same ? 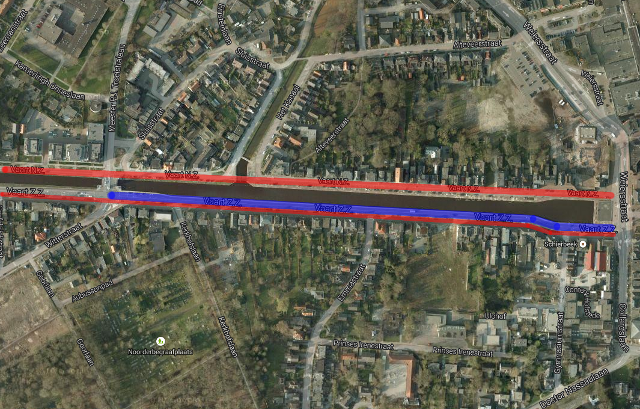 The upper, wider, red line is a primary cycle-route from the west of the city to the centre. 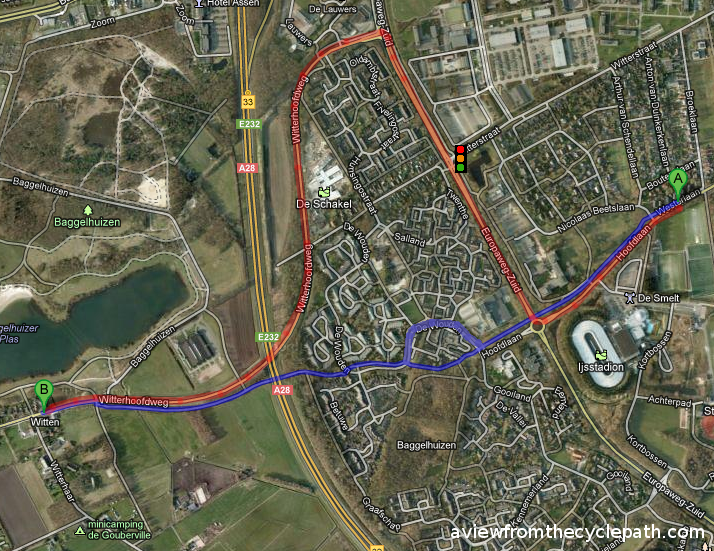 This is the bicycle road to the centre of Assen shown in full in a blog post from a few days ago. 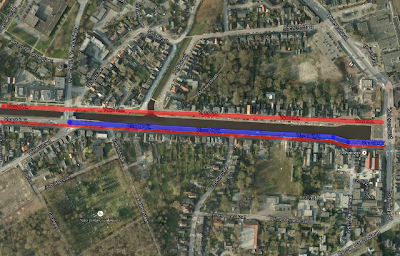 The narrower red line is the cycle-path which forms the secondary route on the other side of the canal. 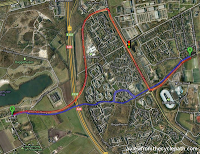 The blue line is the road, which was used for cycle-racing today. Both cycle-routes alongside the canal were maintained as through routes for cycling. Ten years ago I had a part time job in the UK in which I took turns to drive a bus full of bikes across the country with other like minded individuals and we'd try to encourage the public to ride our bikes at events. While the hours were long and the pay was short, I always enjoyed this work. There was actually nothing easier than encouraging people to ride bikes so long as they could do so on a closed track with no cars. People would queue up to take our bikes and ride around with a smile on their faces. However, talk to them afterwards about the possibility of cycling to work or for other practical purposes, "sharing" the road, and of course the smile would drop. This was when I first started to talk about the importance of subjective safety, a regular theme on this blog. I wrote about London's Sky Ride four years ago in a blog post in which I also described the inadequacy of London's plans for "superhighways". A year before that, when the event was still called "Freewheel", I wrote much the same. These highly successful events, together with the experience I had on the promotional tours, overcrowding of rare examples of paths separate from motor traffic and even the recent rather ill-judged comments from Sustrans in which they blame their users for the inability of their infrastructure to cope with the sometimes high usage level all add together to demonstrate a huge suppressed demand demand for cycling in then UK. When is London, not to mention the rest of the UK, going to actually start making progress ? The "superhighways" were built, and they turned out every bit as bad as I said they would, and sadly this has resulted in deaths on the streets of the city. A grand announcement made in March seems to have turned into not very much at all and just this morning I read about how Quietways "could" receive funding in three years time. That's not a promise, just a possibility, but somehow the same man from London who told us 147 days ago that London was already forty years behind the Netherlands has managed to make a headline even out of promising another three years of procrastination. As it happens, there were SkyRide events over on the weekend in the UK. D.J Cook made a nice video in Southampton and Mark Treasure wrote a very good piece about Skyrides and suppressed demand. The video shows well how poeple turn out in their thousands to ride if they will have conditions in which is comfortable to do so. Mark's photos do a good job of how people get home from mass cycling events in the UK, often riding on the sidewalk to avoid the roads. In the Netherlands they do this on the same dense network of cycling infrastructure as they used for the event itself. On Saturday afternoon I read a tweet about Boris Johnson personally claiming credit for having "flooded London with bicycles". It was closely followed by other tweets which said that actually only two bikes per hour pass on a busy through road, that over 90% of those are male and that "Women and parents justifiably scared of cycling on road". London's much heralded cycling revolution is simply not what it is often claimed to be. Cycling from the outskirts by the ring-road to the centre of Assen on a nice sunny Saturday. Temperature just short of 30 C. Bicycles dominate. On the bicycle road, the first 4:10 of the video, there were 59 bikes, three cars, two mopeds. On the other side of the canal, the main route for cars and a secondary route for bikes, there were 15 cars and an unknown number of bikes. I'm not going to even try to count the bikes in the city centre. This is a boring video because it is one long shot with no edits. When people make videos in order to impress they usually take many short shots and edit them together. Sometimes it's necessary to wait for cyclists to appear before starting their videos. Sometimes it helps if the cyclists are held up by a red light so that the accumulate and an impressive group can be seen cycling together. However, this video relies on none of that artifice. There is no need to use techniques like this in order to make Assen look like many people are riding bicycles because many people genuinely are riding bicycles, all the time. The bicycle paths, and in this case a bicycle road (one example of how segregation of modes is possible without building a cycle-path), are busy with bikes all day, every day. We don't have a Boris Johnson-like figure here so no-one has spoken on the radio about how they have "flooded" this city with bicycles. Assen doesn't need that hype in order to have an extraordinary level of bicycle usage. The population of Assen is less than 1% that of London (67000 vs. 8M) but despite the small population, those of us who live in this city make approximately four times as many cycle journeys per day as are made using the shared bikes in London which Boris Johnson takes credit for. It's not just Assen which doesn't need hype. London could do without it as well. Cycling in London does not benefit from exaggeration. Making outrageous claims one after another will not result in London having a cycling modal share like that of Assen or other Dutch cities. Rather than words, London needs to build the infrastructure which is required to make people feel safe and to keep them safe should they choose to cycle. To achieve this requires a far higher standard of infrastructure to be built in London than has yet been proposed or built in the city. It also requires that infrastructure to be ubiquitous. In the Netherlands, even small towns like this one go to quite remarkable efforts to encourage cycling. For instance, most of the canal along which I ride at the start of the video was moved sideways by two metres in 2008. This major piece of work was requires in order to make space for the secondary cycle-route on the other side of the canal parallel with the road. With this blog post I'm extending a second invitation to Boris Johnson to come here so that we can show him what it looks like when a town is genuinely "flooded" with bikes. We have run study tours of cycling infrastructure in the Netherlands for eight years and we're now pretty good at it. We're the only people doing tours like this who Boris can meet who are native English speakers and who combine knowledge of Dutch infrastructure with knowledge of the British situation gained from living for a long period in the UK. Boris, we can show you more than anyone else can. Come and see us and learn about how a real cycling city works. We won't contact the press and we don't want a media circus. See this as a learning opportunity. Think of Assen as a "Mini Holland" which greatly outperforms anything yet planned for London. There is much to learn from this small city because the same things that work well here will also work anywhere else. It takes three whole days to include everything that is on our normal study tours. We operate them mid-week and in term time so that everything can be seen in normal conditions, not holiday or weekend conditions. We have reserved space in our diaries for a possible study tour on the three days starting September 10th and ending on September 12th. The tour takes three whole days so to take part in this tour you would have to travel to Assen on the 9th of the month and leave on the 13th. If you, Boris, can join us on those dates I would be delighted to meet you here. If you cannot then please get in touch with us and suggest some free dates in your diary. We will work with you. If you can only spare fewer days than the usual three then obviously we will have to miss out some of the content of the tour but we can work with that as well. It is essential that for London and the rest of the UK to make progress on cycling that the best lessons are learnt from what the Dutch have already achieved. Start with the best possible starting point and progress from there. Why do we want to do this ? We are British and we spent most of our lives in the UK before we emigrated. Just because we no longer live in the UK this doesn't mean we're not interested in the quality of life of those who still do live there. It would mean a lot to us if we could help British people to benefit from the best practice in the world regarding cycling infrastructure. This is not just about "cycling" or "cyclists" but about freedom for everyone. We would like to see our parents, our siblings, our cousins and our nieces as well as other British people benefit from a change in emphasis in British planning from the car-centricity that has plagued the UK for decades. This process could easily have been started forty years ago. That the UK has slipped so far behind is not an accident, it's the result of making choices. British policy has for many years supported motorized modes above others and this continues with the latest lacklustre "Action for Roads" plans which makes no promises at all with regard to cycling, relying on use of the vague term "cycle-proofing" to pacify cycling campaigners. To make it possible for people once again to choose to cycle en-masse, as was the norm in the UK within the lifetime of many people still alive requires a transformation. The next generation in the UK stands to gain an awful lot from this. What's this about driving to the centre ? Very clever stuff, but in this video there are no bicycles shown at all until 3:10 when he drives past 2500 cycle-parking spaces at the railway station. You then see them in the background when he walks in the city centre at 4:00. It's unfortunate that the "Sensor City" project is apparently completely oblivious to bicycles. Note that Green Waves are old hat. The driver ends up in the same city centre streets as I did in my video, but he does so by driving to a car park near the centre and walking a few hundred metres. You'll note that while in my video there are nearly no cars, in this video there are nearly no bikes. Also note that in my video there are no traffic lights but in his video there are several sets of traffic lights. Actually, the route he took, optimized by the Sensor City computer system as the best possible route by car (so far as I can see not identical to the one shown on his screen), passed through eight sets of traffic lights. When you ride a bicycle through Assen you avoid nearly all the traffic lights. The power of unravelling driving routes from cycling routes is demonstrated quite well by these two videos. By bicycle we take the direct routes without traffic lights. By car we are offered efficient routes which keep us out of the way of people who cycle. Cycling is popular in the Netherlands because it is attractive, pleasant, safe and efficient. Driving is also easy here and the Dutch government often provides good support for driving. However, driving a car is less attractive so people tend not to use cars for journeys which they can cycle. When it comes to convincing people to ride bikes instead of driving cars, carrots work better than sticks. Jenny Jones' first reply was an exercise in "bland but sounding concerned": "Thanks for the invite. The Netherlands (and other countries) are an example we really should follow". After that a green party staffer replied on her behalf saying such things as that she'd "been on cycling trips in the Netherlands before" to which I replied by explaining why this is different. it took many tweets and nearly a month after my first question before Jenny replied again, saying that her "problem is finding time". I replied saying that I would run a tour for Jenny on any date of her choice, on twitter and in email. Nothing more was heard until the 27th of February 2014 when Jenny claimed that I had "offered me dates I couldn't do" and turned her nose up at "freebie offers". Tom Brake ( @ThomasBrake ) 23rd July 2013 8th August 2013 "send more info"
Val Shawcross ( @ValShawcross ) 23rd July 2013 8th August 2013 "no thanks!" More than two weeks have passed since the invitation was sent. Boris Johnson made an appearance on the BBC to make the long discredited claim that London doesn't have enough space for cycle-paths and his sidekick Andrew Gilligan repeated his discredited claim that "it took 40 years to turn Amsterdam into Amsterdam". The proposed "solution" remains that of spending 1/3rd as much as the Dutch, for ten years, though it's obvious that this can never result in catching up, but only in falling further behind at a slightly slower rate. None of the politicians that we invited have yet responded to the invitation to take a Study Tour free of charge. They are still welcome to do so. We have also reserved rooms in in B&B accommodation and opened booking for campaigners for the September 2013 tour. Spaces are limited. Thank you very much for your email of 22 July inviting Mr Johnson to participate in your cycling study tour in Assen and Groningen in September. Regrettably, the constraints of the Mayor's diary make it impossible for him to accept your invitation on this occasion. He has asked me to pass on his apologies and hopes that the tour is a great success and is enjoyed by all. Thank you for your reply. I'm very sorry to hear that the Mayor's diary has no space for the September 2013 tour. Hundreds of people from all around the world have come to us in order to find out how and why the Dutch cycle and to discover how important it is that a city should have a very comprehensive network of good quality cycling infrastructure in order to encourage the population to cycle. While other participants willingly pay for the tour, and normally we require people to fit in with our diary, we are offering something different for the Mayor of London because this is important. We are offering to give up our time free of charge, re-arrange our diaries and meet Boris on any date at all. The Mayor's diary commitments are no reason for him to miss out on the tour. We are doing this because we think it is important that the UK starts to take cycling more seriously than it does at present. Please let us know which dates are available in the Mayor's diary. We look forward to being able to assist London in transforming itself into a true cycling city. We received a reply today from another of Boris Johnson's Public Liaison Officers. Having offered Boris a free tour on any date at all and received a reply which says that he can't come in "the foreseeable future" I think it's clear that we're getting nowhere at all. Thank you for your reply, unfortunately I can only repeat my colleagues previous response. As much as the Mayor is very grateful for the invitation, it is with real regret that he must decline as his diary is already full for the remainder of the year, making it impossible for him to identify a date for a meeting in October or the foreseeable future. I understand that this is not the reply you were hoping for however this is the situation at this time. Four months without an answer to our offer is quite enough. If Boris Johnson or any other member of his team wish to book a tour then they're welcome to do so, but the offer of a free tour is no longer available. Unfortunately, recent statements and actions by the Mayor of London have made it quite obvious that he prefers to bluster and boast even when little has been achieved and will even throw a dead cat on the table rather than to take the concerns of cyclists seriously. It doesn't mean YOU can't come. While the open tours are run only on a few dates each year, we can arrange private cycling Study Tours on almost any date. Please contact us to make a booking. Cycling campaigners often say things such as that there is "no such thing as an unavoidable accident". After crashes occur in which cyclists are injured or killed there is often an effort to lay the blame on the individual driver who was operating the motor vehicle at the time of a crash. Cyclists in English speaking countries often call for strict liability under a mistaken belief that this will improve conditions for cycling. Many people who call for this law mistakenly believe that the law's existence on its own somehow makes drivers behave better, but this is a misunderstanding. The law in the Netherlands exists merely to address issues of material damage and financial liability. It does not apportion blame and is mainly confined to reducing liability of children. Bad driver behaviour is undoubtedly a problem for cyclists. Cyclists often find themselves on the wrong end of the result of bad driving and as a result it is quite common for cycling campaigners to urge drivers to take better responsibility for their actions. There are many ways in which drivers of motor vehicles put themselves and others in danger. For example, drivers should never be distracted by mobile phones or by talking to passengers. They should not look away from the windscreen in order to squint at a navigation system. They should slow down if visibility is bad. They shouldn't eat or drink while driving. They should always allow adequate space when passing another vehicle. They should never pass when going around a blind corner, should always slow-down when there is a risk of ice, demist their windows when they can't see properly, not hurry when they're late for work, never look past a pedestrian or cyclist and see only the car further away, never drive too close to the vehicle in front, never become tired and fall asleep. There is a long list of things that drivers should always do and should never do, but though every driver knows that this wrong behaviour is common. gap. That doesn't mean they all do it. reduce how often people make errors. It's true that road safety would be improved. Campaigners sometimes refer to this as "low hanging fruit" as they see improving driver behaviour as an easy thing to achieve. Danger faced daily on the roads would of course be reduced if only we could convince all drivers to behave better all the time. However, there is a limit to what can ultimately be achieved and it is my belief that we are already quite close to that limit. Diminishing returns for training effort set in long ago. In Western nations which already have relatively good records for road safety there can be only very slight improvements in safety if driving for large efforts in training and enforcement. No matter how often we call for drivers of motor vehicles never to crash those vehicles and always to behave in a perfect manner, they will still make errors of judgement. Cyclists are often seen as a misunderstood and hated out-group. Some drivers make unpleasant comments about cyclists, sometimes are even deliberately aggressive. That cycling campaigners see "bad driving" as a crucial issue is understandable because cyclists come off worst in crashes between motor vehicles and driver error is a common cause of these crashes. Cycling campaigners often equate bad driving with deliberate acts however very few deaths of cyclists are actually due to deliberate violence by drivers. Overwhelmingly, deaths and injuries of cyclists are the result of mistakes made by either the driver or the cyclist. Be kind to animals ! 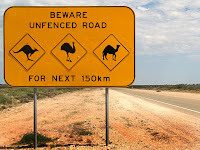 While some drivers express annoyance at cyclists taking space on "their roads", the same emotional outbursts are not common between drivers and animals. Animals are not a human "out-group" and the deaths of animals on the road are neutral with regard to interactions between human beings. I think we can learn something from these deaths. The scale of roadkill statistics is surprising to many people - according to a roadkill study from 1993, an almost unbelievable six million dogs and 26 million cats are killed each year by motorists in the USA. Those are just the "domesticated" animals. Other mammals include 41 million squirrels, 22 million rats, 19 million opossums, 15 million raccoons, 350000 deer. The total number of animals killed on US roads is estimated at one million per day and there are about 200 million drivers in the USA. On average, each driver in the USA kills an animal every seven months. There is no reason to believe that the USA is any better or worse than other nations. The USA is my example for no reason other than the availability of figures for that nation. Australian call for driver education. While many people might not feel upset about the death of a rat, they don't drive over them in such numbers on purpose. Perhaps more interesting are the figures for the pet animals. Very few people would deliberately harm a dog or cat, yet over 70000 cats and over 16000 dogs are killed by American drivers every single day. For reasons of self preservation alone it's a good idea not to run into a larger animal such as a deer yet just the state of Michigan reports that "there were 56,666 deer-vehicle collisions in that state in 1994, and each year deer-vehicle collisions in Michigan kill an average of five people and injure 1,500". Michigan's deer collision rate works out as more than 150 per day. Have they not erected signs to tell people where the greatest risk is ? Are drivers not advised to avoid running into deer ? Of course they are. Have these attempts at education worked ? Of course not. Driver education can never result in there being "no unavoidable accidents", people will always make mistakes. Accidents will always occur. Car crashes are the inevitable result of putting human beings behind the wheels of cars. Human beings simply don't have the ability to behave in a faultless manner so even the most careful people are sometimes involved in crashes. Normal people going about their everyday business with no intention to cause any harm at all are spreading carnage along the roads, not only of the USA (which I picked only because I found the numbers for that country), but also of all other countries. None of this is new. In fact, it's as old as cars themselves and of course the victims of this violence on the streets are not only animals but also humans. Back in 1896 a coroner who investigated the world's first fatal car crash made his view quite clear by saying that "this must never happen again". Much effort has been expended on preventing it from happening. In the 117 years between then and now, driver education has improved enormously and there have been countless campaigns to encourage safer driving. You may ask what the result of this has been and the answer is that there are now 1.2 million deaths every year due to crashes by motor vehicles. Perhaps a small fraction of these might be deliberate acts of murder, but the vast majority are accidental. The connection between animal and human deaths on the roads is a simple one to make. The vast majority of these deaths are caused by motorists who are not deliberately dangerous, but who overestimate their ability, misread the road or who are not paying sufficient attention to what they're doing. This is not so much a failing of individual drivers but simply a normal part of the human condition. People are always distracted. We evolved to deal with travelling mostly by walking, occasionally running for small distances, but we're not actually faultless even at walking pace. Who has never walked into a lamp-post, stubbed their toe or tripped up ? Why are we surprised that the task of controlling a motor vehicle at higher speeds safely for long periods of time is difficult for us ? We're not very good at this sort of task and we will always make mistakes. It's not just the occasional bad driver who makes these errors, but normal drivers who have been trained well, passed a test to show that they understand how to drive well, who have been exposed to education campaigns and who drive past warning signs every day on their journeys. These average and good drivers still crash with alarming regularity. When we pick on an individual driver after a crash has occurred this is an application of 20:20 hindsight. Every driver on the roads makes mistakes. We can't predict which driver will make a mistake next and we can't predict which mistake will turn out to be fatal for a cyclist or pedestrian, or even for the driver him/herself. Punishing an individual for a crash which has already occurred does nothing to prevent the next crash. How can we avoid making mistakes ? We cannot address fundamental human failings by changing the law or proposing more punishment for failure while the underlying task that we are asking drivers to perform remains so difficult. Punishment does nothing to address the reason why mistakes are made, which is that we are human and can't cope with the task of driving. Even the threat of heavy punishment won't make people perfect. The way to address the problem of putting human beings in charge of any dangerous activity is to limit how often they have the opportunity to make catastrophic errors. There is a precedent in aviation . control". Lives were lost as a result. 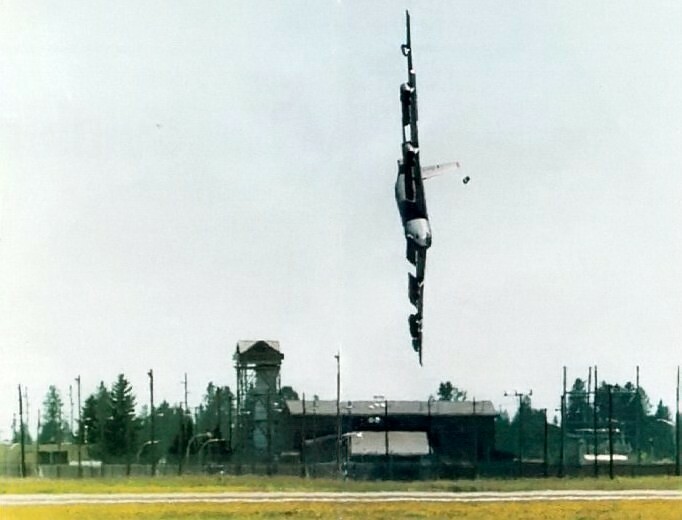 Historically, a large proportion of aircraft crashes were the result of pilot error. 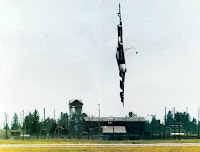 Pilots have crashed aircraft and often brought their own lives as well as those of others to an end due to such simple human failings as overconfidence and showing off. However commercial flying in particular is now very safe indeed. The improvement in the safety record for commercial flights has been achieved in large part by removing the opportunity for human beings to cut corners and make mistakes. This is the reason why pilots do such things as work through a check-list before they launch themselves and several hundred other people into the air. Check-lists might be boring but they result in a consistent check being made of important systems and any problems with them being spotted before they occur. When in the air, commercial aircraft benefit from several sets of eyes on the controls and from automated systems which sound an alarm and draw the pilot's attention if the aircraft is flying too low, too slow, falling quickly, too close to another aircraft etc. Automated navigation equipment has improved safety by removing human error so that aircraft don't run out of fuel in locations far from their destination. Automatic pilots take over much of the boring flying during which human pilots might lose concentration. Automated systems help landings to be made safely when visibility is not good. It is dangerous if aircraft fly too close to each other so they are kept apart. Small aircraft can be affected by the disturbed air left behind by larger aircraft so they are kept even further apart. Aviation has been made safe by removing the opportunity for humans to make so many errors. The same principle can also be used on the roads. In the Netherlands, the principle of sustainable safety is credited with improving the safety of the roads. It is the equivalent of the measures which have been taken in the air. Road designs are made self-explanatory. Everyone knows where they should be without having to read lots of signs. The task of driving or cycling is made safer by reducing the amount of thinking that drivers or cyclists have to do. While this reduces the frequency with which motor vehicles crash, it cannot completely remove human error from driving. Cyclists are kept away from where the inevitable out of control motor vehicles are likely to end up. The source of danger is kept away from those who are most vulnerable. This is how The Netherlands has achieved a better degree of overall road safety than almost all other nations, and a particularly enviable record of road safety for cyclists, pedestrians and children. It's fortunate that the same changes to the environment which remove danger from the roads are also in large part those which lead to a better degree of subjective safety. If roads and cycle-paths are subjectively safe then this makes cycling accessible to the public at large. It reduces the anxieties of parents about whether their children are safe to ride a bike. It reduces the anxieties of older people who ride here in increasing numbers and it results in everyone being able to cycle. Merely changing the law to punish errant drivers will not have this effect. It didn't have that effect here either - "strict liability" came some years after the construction of a comprehensive grid of safe cycle-routes which go everywhere. Strict liability is positive for any country because it determines who has financial responsibility in the result of a crash. In The Netherlands we see no opposition to the law because everyone wants their children to be immune from financial responsibility if a crash occurs between their bicycle and a car. However strict liability is really a side-show issue for any country where cyclists still do not already benefit from proper cycling infrastructure and where cycling is still a minority pursuit because of the lack of that infrastructure. It's a contentious issue which drives a wedge between cyclists and drivers. Drivers see this as an attempt to blame them for crashes which are not their fault and it is not surprising that they see this as unjust. Many of the people campaigning for the law don't understand what its true scope is and some of the campaigners actually really are asking for an injustice to be made law. Today's drivers are potentially tomorrow's cyclists. It makes no sense at all for cyclists to put effort into alienating themselves from their potential allies, but this is precisely what is happening with the emphasis on blame which comes through strict liability campaigning. Though the potential benefit is very small indeed, this is still a difficult battle to win precisely because it appears to be unjust. Strict liability is simply not a worthwhile thing to spend time in campaigning on in countries which face far larger problems. To campaign on this issue consumes considerable campaigning effort for something which can never result in the masses cycling because it doesn't even start to address the main issue standing in the way of people riding bikes. The Netherlands achieved success by transforming the environment to be safe for all road users. If you want to copy the Dutch success in cycling then you need to campaign for all those things which really made and continue to make a difference in the Netherlands, not just anything described as "Dutch". A few tens of km South of Assen. Segregation of all modes. Motorway on the far left, local road in the middle, cycle-path on the far right. 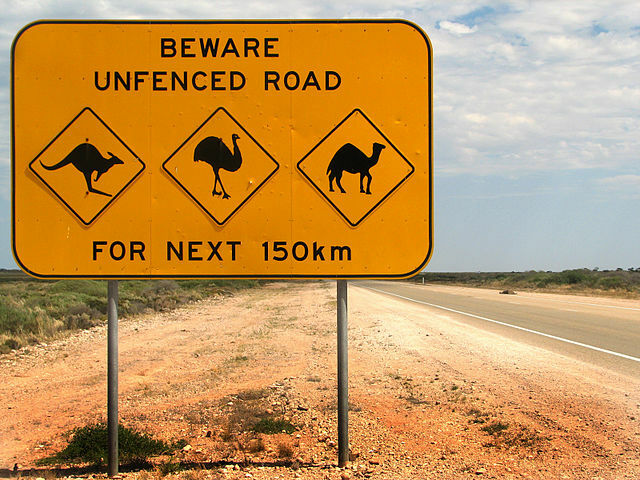 All pass under a bridge for wildlife which aims to address the problem of roadkill. Segregation of modes is the big thing which enables mass cycling. Just like humans, animals benefit most in safety terms from being segregated from motor vehicles. Wildlife bridges are important because for some endangered species being hit by motor vehicles is one of the most significant causes of death. What this post is not about Various comments have been made about this post, for example: "David Hembrow says accidents will happen, and there's no point in holding bad drivers accountable". This is, of course, not actually what I said at all and the thread which carried on afterwards went into even wilder diversions from the subject of this post. There are a small number of genuinely bad drivers. These drivers break many laws and take many more risks than average and of course they feel the force of the law. Ideally they should not be allowed to continue to drive. Some people have even used motor vehicles deliberately as weapons. In these cases an existing law has been broken. Assault with a motor vehicle as a weapon should be treated just as seriously as assault with any other weapon. There may be examples in some countries where where there have been problems with achieving prosecution when a car was used as a weapon and this may well be something worth campaigning about. However, none of this is what I wrote about above because criminals cause but a small minority of the total number of crashes which occur on the roads. Most drivers are neither particularly good nor particularly bad. When talking about "good drivers" and "bad drivers" we are often actually talking about the result of a perfectly average drivers in an average states of concentration who find themselves in different circumstances from one another. Most average drivers never cause the death or injury of another human when driving. However, most of those who have caused death or injury were no less skilled than those who have not. This comes down in large part to nothing more than luck. An average driver in the wrong place at the wrong time may cause a death. An equally skilled driver who never had the same bad luck might drive for his/her entire life without ever having even a minor bump. That someone could end their life with a perfect driving record does not necessarily indicate that they were a better than average driver; it is more likely that it shows they had better than average luck and found themselves with fewer dangerous situations to deal with. Handing down particularly harsh punishment on a driver who was involved in a lethal crash after it has already occurred will do nothing to prevent similar bad luck leading to a similarly skilled driver being involved in a similar crash in similar circumstances at some time in the future. Indeed, if the road remains in the same state as when the first crash occurred then this is almost a certainty that the same thing will happen again in the same place if given enough time. If we wish to address the problem of average drivers' mistakes causing injury and death, punishment is an almost useless response. Even if every drive who has already killed is locked up in prison this won't do anything to stop other average drivers faced with the same difficulties from making the same mistakes. However, changing the road design to make mistakes less lethal will work for all drivers. This is the gist of Sustainable Safety. If you remove conflict from roads and, especially important for cyclists, remove vulnerable people from the path of those in motor vehicles, then safety on the roads is improved. 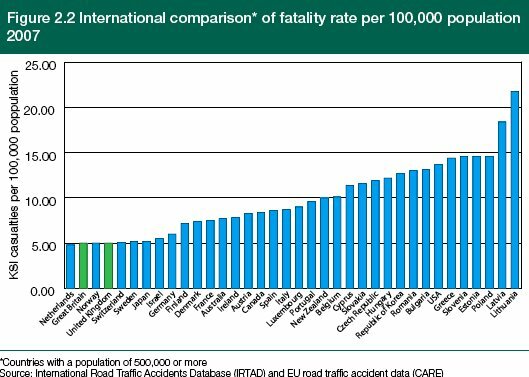 The safety of roads in different countries is in very large part a function of their design and far less a function of the behaviour of different country's drivers. We're all from the same gene pool and all populations have a similar range of abilities. We all have the same human failings. 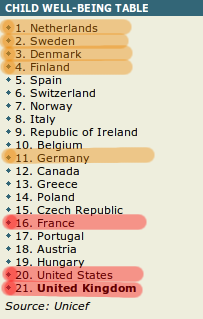 The difference between the countries on the left and the countries further to the right come down in large part to the standards of road design. This chart shows overall road safety and does not highlight the safety of cyclists. While almost all oher countries would gain increased safety for their drivers if they adopted infrastructure such as is in the Netherlands, for cyclists the safest place by far is The Netherlands (read footnote at that link). Cyclists elsewhere especially stand to gain from campaigning for the type of infrastructure which is common in the Netherlands, but it's worth bearing in mind that adopting this infrastructure will also benefit all other road users. The benefits of Dutch infrastructure also include keeping drivers from harming themselves and each other quite so often. We've had a few very busy weeks. First my Mother came to stay and cycle with us, and then several different cycling visitors have come to see us and find out what's been achieved for cyclists in this area. As a result, we've done several short tours and because we've been doing things for other people I've mostly not been able to take photos or make video for myself or this blog. However, an opportunity did arise yesterday when I rode to Groningen with Clarence Eckerson Jr. On our study tours we make a point of showing people the worst as well as the best infrastructure and to explain why the less good parts are considered to be a problem. Cherry-picking of a few highlights might be possible in a few hours it takes a lot more time to give an accurate impression of what cycling in the Netherlands is about and we try to do this even with people who have less time than the three days of our usual tours. Clarence and I talked about many things including how despite having the highest cycling modal share in the world, Groningen missed out on winning the Dutch "Cycling City of 2011" award. It's still a wonderful place to cycle, but the city had not invested enough in making it better. In particular, two pieces of infrastructure were picked out by campaigners as a stick with which to beat the city and I was keen to show Clarence what "bad" was in this context. Cor van de Klaauw from Groningen city visited both of them with us and discussed the problems. Some time ago I wrote and made a video about one of these points: the most dangerous junction in the Netherlands. Yesterday I had the opportunity to video the other: a new bridge which is steeper than cyclists would like it to be. It's considered to be "a challenge like Alpe d'Huez" for elderly people. By international standards it's not actually very steep and the cycling provision on both sides of the road over the bridge is actually very good. However cycling has a very wide demographic in The Netherlands and there are very many elderly people riding bikes here. This bridge genuinely does cause some difficulties for some of them as you can see in a previous post. This bridge, which provides a new good quality link for cyclists and drivers alike, is considered to be not quite good enough to win a "cycling city" award. It's one of the things which was used to criticise Groningen in 2011. Sadly, the problems in London have continued with more deaths of cyclists on the roads. I have criticized London's absurdly named "superhighways" since they were first announced in 2009 because even then they were obviously not up to the job of creating an environment in which mass cycling could take place in safety. These "superhighways" have a far grander name than anything else, but they are not even remotely close to the quality of infrastructure which is the subject of criticism in the Netherlands. London's more recent plans are equally lacklustre. For decades, British politicians have pacified cyclists by making vague promises about future change, producing impressive looking press-releases and plans, hyping up projects which divert attention to the wrong things, using lots of words to describe remarkably little, and making endless promises of jam tomorrow while not actually starting the process of change at all. In the past, the votes of cyclists have been captured by making these vague promises and relying on the short collective memory of cyclists so that people will believe the same story yet again. Due to the frequency with which people give up cycling in the UK, there is a high churn rate amongst cyclists and this has assisted the very short collective memory of what has happened before. The internet offers the potential of allowing younger campaigners to benefit from the experience of those who have already seen these things happen. It has the potential to make the collective memory of campaigners longer. More people are waking up now to the fact that plans made by London are simply inadequate. The death of 65 cyclists during Boris Johnson's term of office is a high price to pay for incompetence. If you don't click on any of the other links in this post, please do read that last link to a post by Markbikeslondon and this one from an obviously angry Voleofspeed. There's yet another protest in London today. I urge any of you who are there or near by to try to get to it. The Berlagebrug is being changed. The last two study tour groups which I took to Groningen saw some of the works going on around this area, cycling conditions are improving. A still from July taken from the video above compared with the situation in September when the cycle-paths were being reworked. At the end of the video above, after the bridge, I turned right onto one of few roads which still had just a cycle-lane. This is being upgraded into a proper segregated cycle-path and the cycle-paths leading right up onto the bridge are being improved. I don't know as yet whether this will decrease the slope. However campaigning in Groningen about the quality of the Berlagebrug will in any case have paid off. The bridge will work far better for cyclists after these works are complete than it did immediately after the bridge was built. Nothing stands still in the Netherlands and this is why no-one can "catch up" by doing less. Readers from places other than London: Please realise that there is nothing to be gained by any other place trying to copy London's policies which consist almost entirely of hype and hot air. 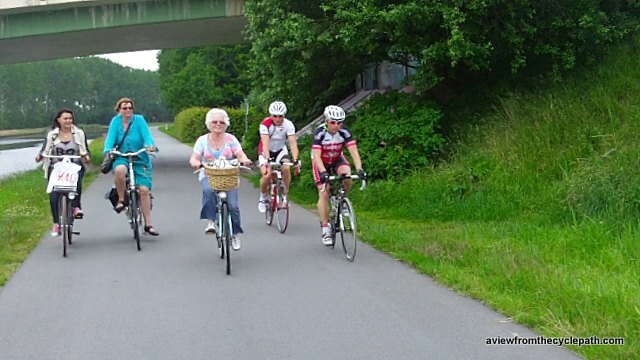 If you want to achieve mass cycling in your country, emulate the best example. This means The Netherlands. Take a study tour. and it's also free at at the hospital. One of the many recurring myths about the Netherlands is that it's expensive to use a car here and that's why people cycle. However, this not really true. Relative to other EU countries Dutch people find cars to be relatively easily affordable but they often make a positive choice not to own a car. The Dutch government actually allows employers to offer a tax free perk to those with a long commute by car, and many employers choose to offer this perk. If you own a company in the Netherlands, you can pay employees with a fixed place of work a predetermined travel allowance. You are not, however, required to do this. Often agreements have been made in the employment contract or in the collective labour agreement (CAO) about the allowances for travel expenses. You can pay this kilometre allowance for both commuting and business trips. Allowances of € 0.19 or less per kilometre are free of tax and social security contributions. If an allowance exceeds € 0.19 per kilometre, the Dutch Tax and Customs Administration (Belastingdienst) will regard the excess as wages. If your employee (partly) travels by public transport, you can choose. You reimburse no more than € 0.19 per kilometre free of tax or you reimburse the actual travelling expenses free of tax. Nineteen cents per km travelled goes a long way to cover the actual cost of driving many motor vehicles, and for economical or older vehicles it is likely that the driver will make a profit on this. It can also be claimed by people who car pool, meaning that a total of 38 cents per km is paid for one car - definitely profitable. It is also possible to claim the allowance for cycling and this results in a tax free bonus as the cost of cycling is generally much lower than that of driving. I received this allowance for a 60 km per day commute. My commute earned €11 per day so in effect I was paid better than €6 per hour, tax free, to cycle. However, this option not open to most people as the minimum distance covered by the regulation is 10 km and for most people that's too far to commute by bike. The leading cycling cities in almost all, if not all, countries are cities where large numbers of students live. I've discussed several times before how students and relatively recent graduates are uniquely placed to find cycling attractive as they're predominantly confident young adults, usually without children, with little spare cash and usually with short journeys to make. The Netherlands is no exception to this. The leading cycling city in the Netherlands, Groningen, is a student city. 50000 students live in a city of 190000 people and as a result of this influence Groningen residents have the youngest average age of any Dutch city. 700 more indoors around the corner. However the Dutch actually provide a disincentive to students who consider cycling. Free public transport for all qualifying students. Students may use buses and trains across the entire country completely free of charge. It's not actually a bad policy. Students must claim their free transport for use either during week time or at the weekend, but not both simultaneously. Our eldest daughter cycles to college within Groningen but uses her free public transport on the weekend in order to visit us or friends who live elsewhere in the country. This is why cycle-parking at the main railway station in Groningen is most full on weekends. Our neighbour's daughter who still lives at home uses her free transport to travel to college in the week (a 60 km round trip each day is more than most people would choose to do by bike) but she cycles to local friends at the weekend. The pass also allows students to claim a 40% discount on the trains at any time that they cannot travel for free. How many students take a free bus instead of cycling ? In Groningen, it is estimated that the free bus pass is currently used by 5000 students a day on one of the main routes to university buildings. If the free bus pass was not available, it is estimated that around half of those students would travel by bicycle instead. So why do people cycle ? Both these policies, of giving commuters encouragement both to lengthen their commutes (Dutch commutes are in fact the longest in Europe) and to make them by car, and the other policy of providing a free of charge alternative means of transport for students, must have some negative effect on the cycling modal share of the Netherlands. Yet despite both these policies the population still views cycling as a positive choice because of the benefits that it brings. Cycling remains popular with a huge proportion of the population despite the government seemingly using fiscal measures in an attempt to discourage it. Cycling is a convenient and economical means of transport everywhere. However, in most countries it does not reach its full potential. In The Netherlands, a bike offers more. The infrastructure not only makes cycling even more convenient than in other nations but it also makes cycling into an option so safe and pleasant that nearly everyone is attracted to cycling. Student cities will of course always tend to have more cycling than non-student cities. City centres will always be busier than suburbs. Longer commutes are less amenable to cycling than short commutes, but good infrastructure in all of these locations is fundamental to unlock whatever demand exists for cycling in each place with each given population. There seems to be some confusions amongst readers about what they perceive as anti-driving measures in the Netherlands. It's quite normal in this country for driving routes to be longer than cycling routes but this is not so much as a result of anti-driving measures as of pro-cycling and pro-pleasant neighbourhood measures. The problem of rat-running through residential areas has been almost eliminated by making those areas almost impossible to use for through journeys by car. Cyclists can use direct routes through neighbourhoods because this encourages cycling and doesn't harm residents. However, driving routes go around residential areas because cars going through them do harm residents. The same principle is applied in town centres and in the countryside and there are many thousands of examples of this throughout the entire nation. However while these measures make driving slightly less convenient than it might otherwise have been, they do not make it impossible. Dutch roads are well designed and well maintained and a pleasure to drive on. Similarly, residential car parking is quite generous in the Netherlands. New developments are built with ample space to accommodate the cars that people own and older streets are rebuilt to accommodate them. This means cars can be parked without causing conflict with pedestrians and cyclists. transport in all of Europe. The Dutch government can even offer support for driving and public transport, as demonstrated in this blog post, and people still choose to cycle here. They do so because cycling is better for them than any alternative, not because they've been forced out of cars. The end result is that despite this being a rich nation where people can afford to own and use cars and other motorized forms of transport, the Dutch people make a positive choice to use non-motorized forms of transport more than the people of any other nation. Is this not the result we should all hope for ? Carrots work better than sticks. Today we went on a very enjoyable family trip to a seal sanctuary in Groningen. The 120 km round trip was too much for the family by bike so we made one of our rare trips by car. We didn't check in advance, but parking our car turned out to be free of charge in a half empty car park- an experience we've had almost everywhere that we've gone by car in this country. On this hot day I'd much rather have ridden a bike. That would have been a positive choice, much more pleasant. The cost of parking a car is immaterial. Many British cyclists ride from Land's End to John o'Groats at some time or another. The distance between these two points, from the extreme South West of Cornwall to the extreme North East of Scotland, makes for the longest ride possible within the mainland of Great Britain without turning around. Riding LEJOG has become a sort of rite of passage amongst cyclists. Yesterday, I read the sad news that two people riding from Land's End to John o'Groats had been killed by a truck on the A30 in Cornwall. I knew instantly the conditions under which this tragedy had occured because I rode there with a friend exactly seven years ago. In our write up of our ride we described this road as "lethal". We didn't mean this as a prediction. A road like this with a 70 mph ( 113 km/h ) speed limit and no-where to go to get out of the way because the road has no hard-shoulder is hardly ideal for cycling. There is no good way to get out of the way of motor vehicles which present a danger. Where it is possible to pull off the asphalt surface your wheels drop from the hard edge of the asphalt an uncertain distance onto an unknown soft surface which will almost certainly cause a crash. However, in many places even this isn't possible because the safety barrier prevents cyclists from being able to get out of the way. Why did we ride on the A30 ? In our case we didn't actually set out to ride on busy roads like this because we knew they could be both dangerous and unpleasant. That's why we planned a route of about 1000 miles which would avoid the worst of the roads rather than taking the shortest possible route of about 870 miles which is largely in conditions like this. However progress is very slow if you try to follow small lanes, and it's not necessarily any safer because these also are not designed to make cycling either pleasant or safe. There are many blind corners from around which cars can suddenly appear and rough surfaces which can cause problems for cyclists are also common. That's why, even though our intention had been to find a more pleasant route, we ended up on the A30, as do so many LEJOG cyclists even if they had no desire to ride in such conditions as this. We cut short our time on the A30 after being repeatedly passed too close by too many vehicles. The final straw was an incident in which two large articulated lorries, side by side with one slowly overtaking the other, passed us with just a few cm to spare and their horns blasting. We were definitely not having fun at this point so at the next junction we returned to the lanes. I returned home from this tour on a high. Several dangerous things had happened, but I'd survived them all. The experience is wonderful, but afterwards you have time to reflect on what could have happened. Riding from Land's End to John o'Groats is enough to be a challenge, but this challenge should be against yourself, not against the danger from motor vehicles and dreadful conditions provided for cyclists on the roads of Britain. The A30 is really a motorway in all but name. However, because no other road has been provided which offers anything like a direct route through the countryside in this part of the UK it is used by many cyclists making their LEJOG journey. Cycling conditions like this are far from unique. There are many roads all across the UK which offer frightening and dangerous cycling conditions comparable with the A30. Many of them are in places where there is no good alternative route and so they serve as very effective deterrents against cycling even amongst people who like to cycle. Another example covered in a recent blog post from Cambridge was about the abuse meted out to a disabled person who dared to use the only route provided for him to travel a short distance from his village into the city. This rather nice place for cycling is not a road. It's also not called a "super-wotsit" or a "mega-thingy". It's merely one of many very ordinary and mundanely "cycle-paths" in the Netherlands. My Mum's in the middle. Note that all types of cyclists benefit from cycle-paths like this and they use them for all types of journeys. As it happens, my mother (aged 74) is visiting us at the moment and yesterday we went for a short tour together through the countryside. We took it easy and rode about 60 km through the countryside to sit at a beach and ride on a ferry. During our short tour we hardly saw any cars at all. Almost all the distance was covered on cycle-paths, many of them quite generously proportioned as shown in the photo above. We would never have done this if we lived in the UK. It's simply not safe enough and not pleasant enough to do purely for the fun of it. In the UK we couldn't have ridden side by side for hour after hour in peace and enjoyed each others' company as we cycled. While my mother is fit and enjoys cycling, she has never considered riding her bike the much shorter journey between her home and my sister's home in the UK. The distance is just 10 miles but conditions on the roads she would have to cycle on mean that it might as well be a thousand miles by bicycle. In the UK and other similar countries, many short distances like this can be cycled only by those people who might set off to ride a thousand miles, such as myself or the unfortunate victims of yesterday's crash. While the most obvious place to start is with emphasizing infrastructure within cities, it is not only within cities that we need to provide better conditions for cyclists - cycling should be viable as a safe option for all journeys including shorter and longer distances to and between villages, for holiday trips and for people making long tours. distances accessible to more people. not against the danger of traffic. Good cycling infrastructure benefits everyone. It's not just for people like my mother when they are on holiday, but also people like myself who are keen on cycling every-day. I was always a keen cyclist but I ride far more kilometres each year now than I ever did when I lived in the UK. Why ? That's simple. It's more pleasant and it's more convenient here. We ride long distances without ever having to "share the road" with motorised vehicles travelling at 113 km/h and therefore everyone does it more often. The same comprehensive network of high quality cycle-routes which best serves local cycling and children going to school is also the best infrastructure to serve fast cyclists and longer distance tourers. All cycling in the Netherlands is safe. My thoughts are with the families of those killed yesterday, and indeed with the families and victims of all road crashes, whether cyclists, pedestrians, equestrians, motor cyclists or drivers. The greatest danger to all these groups comes from motor vehicles, primarily the vast number of private cars. Especially where they mix with more vulnerable road users, the result is all too often lethal. Back in 1896, the coroner who investigated the very first death due to a car said "This must never happen again". How did we become so passive about something which was is no longer an exceptional cause of death but which now kills 1.2 million people every year ? I also covered the danger of British dual carriageway A-roads back in 2010. The cyclists killed yesterday have been named as Andrew McMenigall and Toby Wallace. They were riding to raise money for the very worthwhile Kirsten Scott Memorial Trust. Problems like those which occur on Britain's roads are not limited to that country. On Monday night, cyclists all the way around on the opposite side of the world in New Zealand were killed and injured when riding on a similarly unsuitable road despite taking the precautions of riding single-file and having lights on during the daytime. Road design which causes this degree of conflict is lethal for cyclists everywhere that it exists.